I strongly believe that the words we use have a big impact on the way we view the world and how we feel. I think it makes a difference when we speak accurately instead of using what I call exaggeration words. Exaggeration words like never, always, forever, all over, and hate are rarely true. We use them when tensions are high or when we are frustrated and want to make our point more forcefully, but they distort the situation and often make it worse. If we take a moment to calm down and contemplate what we’re really feeling, we can find more accurate and productive ways of expressing ourselves. Even though children use these phrases naturally, parents can teach them how to express themselves more appropriately. One way to do that is by modeling the correct behavior yourself. Have you ever found your child walking in the house with muddy shoes and said something like, “You’ve got mud all over!” or “This will take forever to clean up!” If you change those statements to, “You’ve tracked mud on the carpet,” and “It will take me a long time to clean it up,” you will feel calmer, and your children will learn a better way to express themselves. It takes practice and self control, but it will be worth it. In addition, your child will respond better because he will feel that you are being honest and accurate. A child is like any other person – when he hears someone exaggerate he tends to tune them out. When people exaggerate, others around them roll their eyes and think, “Why are they getting so upset?” Your children will listen and respond better when you speak in measured words and tones. Start to notice how you speak to your children, especially in frustrating situations, and see if you can find ways to eliminate exaggeration words and phrases and replace them with accurate statements. Many exaggeration statements are negative and demeaning to children. It may be tempting to say, “You never listen!” or “Why are you always making messes?” But these types of statements are not true for any child. Every child, every person, listens sometimes and sometimes doesn’t; makes messes sometimes and sometimes doesn’t. If you are concerned about your child’s problem with these behaviors, you can talk to them about it in a more direct, encouraging way, such as, “I want you to listen when mommy talks to you.” You should try to find times when he does listen and positively reinforce that. We’ve all said these types of things in anger and frustration, and it’s okay if it happens occasionally. But you should make efforts to get in the habit of controlling what you say and speaking positively and accurately. Refer to the post Practice Patience for tips on how to stay calm. When your children use exaggeration phrases, you can teach them that speaking like that is not factual. For example, if one of my daughters said about a friend, “She’s always so mean!” I would NOT respond by saying, “No, she’s not” or “Don’t say that.” Those responses shut down communication, don’t really get to the bottom of what is going on, and don’t teach the child about accurate speech. I would say, “Sometimes she is mean, sometimes she isn’t. What happened that made you say that?” This reply, “sometimes _____ and sometimes _____” is very useful for conveying the nuanced reality of the world. Life is complicated, and things are rarely black and white. It takes a long time for children to recognize this, but this type of response helps them begin to understand it. To the declaration, “She never shares!” I would say, “Sometimes she does, and sometimes she doesn’t. How can we solve this problem right now.” Focus your child on the current problem and possible solutions, and steer him away from making general statements about a person or state of affairs. Kids will often say, “I hate you!” to a sibling or parent. In this case, I would remind them of the rule of not saying hate with a simple, “We don’t say hate” and then explain, “Sometimes you like me (or her), sometimes you don’t, and that’s okay. But you need to be respectful when you speak to me.” You’re not criticizing the feeling. Feelings come naturally and can’t always be controlled. But words and actions can (and should) be controlled. You’re teaching the child that no matter what he is feeling, he still needs to speak respectfully, which is a valuable lesson. You should be modeling this behavior as much as possible. A corollary to this is the inevitable time when your child says, “I hate myself.” Most parents will respond with strong emotion, saying, “Don’t ever say that! You’re wonderful!” But again, that conveys that he shouldn’t communicate how he feels, and it closes off the discussion from further enlightenment. The better way is to first remind the child of the general rule (without a lot of emotion): “We don’t say hate.” That rule applies in any situation. Then follow up with, “What is going on that makes you say that?” Ask an open-ended question that allows the child to express his feelings and have a conversation with you about what is going on in his life. When my children say something like, “You never let me stay up!” they know I will respond with, “That’s an exaggeration word.” Sometimes I try to get them to restate the phrase, and I will help them if necessary. For instance, “Why don’t you try, ‘Mom, I want to stay up, and I feel like I haven’t gotten to for quite a while. Can I, please?’” I try to remind them that they can tell me how they feel and ask for what they want. They can say, “I feel angry,” or “I feel frustrated.” (I literally say this to them, giving them the exact words to use to express themselves). But they can’t speak unkindly or disrespectfully, and exaggeration words often fall under those categories. Hopefully it is clear that there are many reasons to get in the habit of using accurate words and avoiding exaggeration words. Doing so can ease high emotions and give you a greater chance of resolving situations peacefully. It will help you and your children get control of and express difficult feelings. This type of speech helps children begin to understand the complicated world and learn that sometimes you feel one way and sometimes you feel another; sometimes a person is mean and sometimes they are nice. It also allows you to give compliments that motivate and feel sincere rather than provoke anxiety or comparison. It’s funny that I can write a whole post on getting kids to clean their rooms, but it’s actually quite a complicated skill, and sometimes an emotionally-laden one as well. All parents want their children to be neat and tidy and keep their rooms organized. But it’s one of those developmental processes that takes years to complete (approximately 18!). I want to talk about the appropriate developmental expectations for children keeping clean rooms (at various ages), and give some tips and tricks to help your child learn this skill. From a parent’s perspective, cleaning a room should be a simple task for a child. The room is messy; clean it up. There are clothes and toys on the floor; put them away. Unfortunately, this is not the case. Children’s brains don’t function in the same way adults’ do. If children could verbalize their subconscious processes, they might say. . .
“Why would I want to put things away?” For some reason small children get way more pleasure out of taking things out of a cupboard or drawer rather than putting things in. I think this is a joke God played on parents! Children naturally want to explore their world, and that requires emptying any space they come across. In my efforts to positively reinforce behaviors I wanted, I tried to make a big deal whenever my little child would put something in (it was a rare occurrence, but I kept a look out). If she started putting toys in a toy bucket or socks in a drawer I would say, “Yay! You’re putting them in! I like it when you put the toys in!” I did not show as much excitement when she took things out :). “I don’t see any mess.” Their enjoyment of emptying containers is one reason why small children have difficulty keeping their room clean. Another reason is their lack of attention to detail. They can walk right past (or through) a mess and not notice it. They don’t necessarily know how their rooms should look, so they literally don’t “see” a problem. “I don’t know where to start.” A third struggle is the overwhelming nature of a messy room. If you say, “Go clean your room,” to a child under ten, it really is too much for them to handle. There are so many aspects to the task: the unmade bed, clothes on the floor, scattered toys of different categories. They don’t know where to start, and they don’t have the ability to break the task down to smaller chunks. This means they are discouraged before they even start. “I want someone with me.” Furthermore, children are social creatures. They don’t want to work by themselves, and we all know they get distracted when they are working alone. Most children work better with someone by their side. They don’t think it’s “fair” that they do the cleaning on their own. 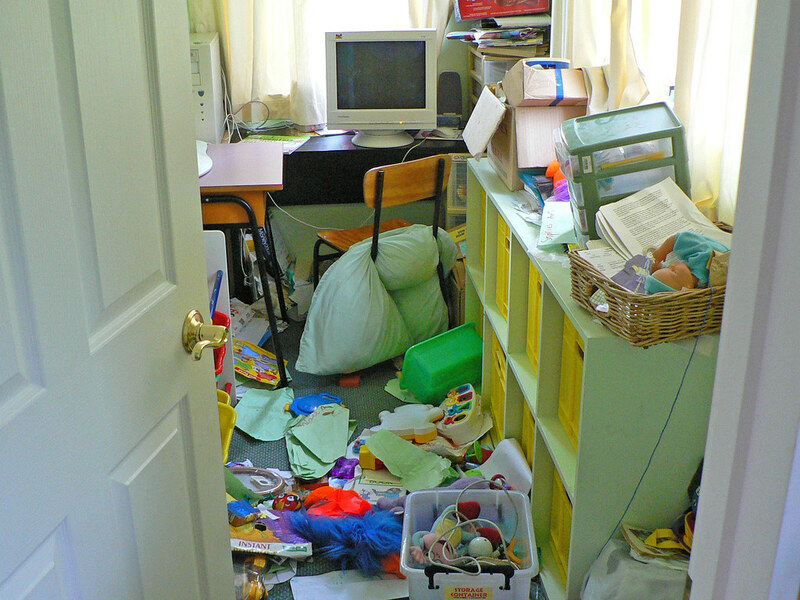 “Or what?” Instructing children to go clean their room can set you up for a battle of wills. Children, especially between the years of 2-5, are willful and defiant; they are working out that separation between their parents and themselves. They test boundaries – it’s as if they are saying, “Clean my room – or what? !” If you approach this the wrong way, you are faced with enforcing stricter and stricter consequences (punishments) for not obeying. As you hopefully know by now. . . there is a better way. When my oldest daughter was two and a half (and before I knew or understood any of these principles), I got in just such a control battle with her. I remember a time when the living room was littered with toys, and I wanted her to help me clean them up. I’m sure I didn’t say anything more original than a few versions of, “Please clean up the toys.” She wandered around aimlessly, not picking up any toys. The less she did, the more frustrated I became (I had very little skills or tools for calming myself and remaining patient). I made threats about taking the toys away, etc., but these threats were not working. I was getting very angry and didn’t know how to motivate her. 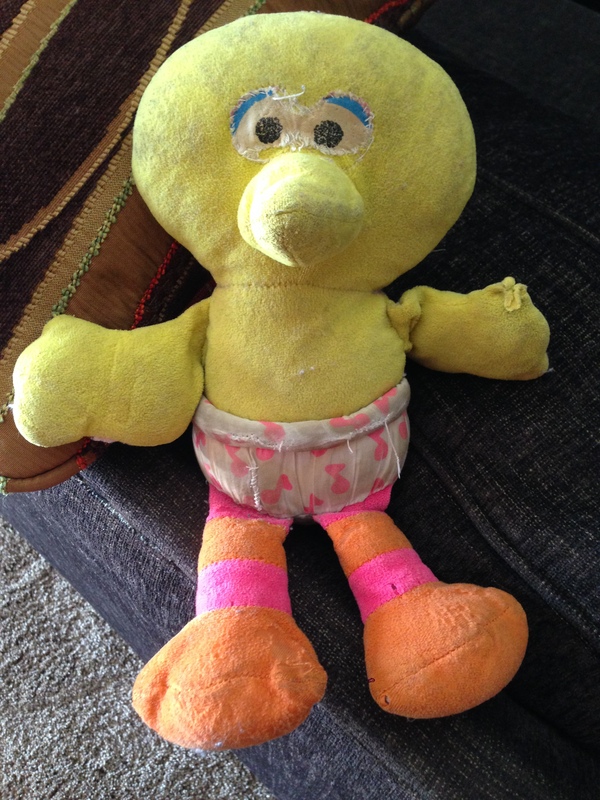 She had a beloved stuffed Big Bird which she called Birbie. She took him everywhere and slept with him every night. I decided this would be the threat that would finally propel her into action. I threatened to take him away if she didn’t clean up, and . . .nothing. She cried and held tightly to Birbie but wouldn’t clean any toys. Now I had painted myself into a corner. As I took Birbie away and put him on a high shelf I felt terrible and ineffective. I knew I hadn’t changed her behavior for the better. I’d only been the mean mom who took her favorite lovey away. It was not the solution I was looking for. Now I know the better way! I have learned many more tools for motivating children, and I know to avoid these battles of wills. Here are a few ideas to consider and tips to keep your children motivated and you sane. I mentioned above that children want company when cleaning. I’ve learned to avoid saying, “Go clean your room” to a young child. Instead I would say, “Let’s go clean your room together.” It’s always a group project. I stay in the room with her and work beside her. Sometimes I work slowly, or I put away the same item over and over! Things will go more smoothly if you stay with the child, giving her companionship and some direction, keeping her focused and making it fun. If the child is old enough to read, break down the individual tasks of the overall chore on a 3×5 card. Write “Clean Your Room” at the top and then list the parts such as: make your bed, put dirty clothes in the laundry basket, put away clean clothes, pick up any items on the floor and put them where they go, etc. This card will help prevent them from getting overwhelmed and frustrated. (You can do this same thing for other chores like cleaning the bathroom or yard work.) A child doesn’t have the cognitive capacity to do this break down on his own. It’s very helpful if you teach him how to do it by modeling it and/or writing it down. This point-by-point list is much more manageable for a child than just tackling the whole room or the whole chore at once. When you go together into a room to clean it, they might have this card with them, or you can verbally guide them through this same approach. You can explain the various individual tasks and ask, “Do you want to make the bed or find dirty clothes first?” You can each take one portion after another until the room is done. For young children, give even smaller, simpler tasks that will be manageable for their age. This avoids overwhelming and discouraging them. For example, “Would you like to do Barbies or books?” They clean up whichever category of toy they choose, and then you give them another choice. Giving choices is very important in a chore such as cleaning, where they don’t really want to do it in the first place. Always try to present different options of what they can do. It gives children a sense of control and melts resistance. It also makes the job seem easier because they don’t have to think about the whole room at once. Don’t overdo the choices, though. Two is really enough; more can be overwhelming. Try to motivate kids to clean by being creative and fun. Tell them to pick up all the blue toys (or ask them if they want to do blue or yellow toys, for instance), or have them pick up ten items and put them away. If stuffed animals need to go into a toy box or bucket, make “baskets” and give two points for each shot (sneak some math in, also!). If they like a certain character, have them pretend to be that character (say, Superman) and show you how fast Superman could clean up the blocks. Sometimes I would tell my kids we were pretending to be the Clean Up Fairies, and when we were done the real us would come in and be amazed at the clean room and wonder who did it! (I also do this to encourage “secret service” to other family members: pretend you’re the Clean Up Fairy and do your sister’s chore, then she will be happily surprised and want to know who did it!). One fun and creative way to motivate kids to clean is called Five and Five. Carry a timer with you and set it for five minutes. That’s how long you all work on cleaning the room (you can give the choices and direct as needed while cleaning). When the timer goes off everyone stops and does something fun together – maybe read a book, play blocks, rough-house – until the next five minute timer goes off. Then you go back to cleaning. My kids loved this method, but it was so hard for me! Once we got into cleaning, I just wanted to finish! It killed me to stop and do something else. As a proactive parent, you should think about the timing of your cleaning. Is your child more cooperative in the morning or in the evening? Maybe it’s best to wait until after he’s eaten a meal. Timing can make a big difference in how helpful your child is. If you’re trying to get a room clean and getting a lot of resistance from the child, maybe leave the mess (which is hard, I know!) and try again later. If you can find the time of day he’s most compliant, try to assign chores during that time on a consistent basis. Here’s another great technique that has to do with timing. Use something your child is requesting as a motivating factor for cleaning. For instance, you know the basement toys need to be put away. The children finish and meal, and one asks, “Can I go to a friend’s house?” You answer, “Yes, as soon as the toys in the basement are put away.” Or if she is working on a craft project at the table and then asks to watch a show, you say, “You may watch the show when the craft supplies are put away.” There have been so many times when I’ve said yes to the request and realized later that I missed a golden opportunity of motivation! It’s easy to get kids to do some chore when they want something else. The chore seems painless and quick because they are looking forward to the next thing. Think about your own attitude toward cleaning. Do you view it as drudgery? Do you go into a room and make negative comments about how messy it is or how long it’s going to take to clean? If you do, your child will sense that and be less likely to clean cooperatively! You can change the statement, “We have to go clean your room now” to “We GET to go clean your room!” Act like you enjoy it, talk about how nice it will look when things are put away and how your child will be able to find things. Have a good attitude about your own cleaning chores. When you’re done cleaning a room, comment to your children on how great it looks and how nice it feels to have a clean space. Your example will have a great effect on their cleaning behavior. Each family’s standard of cleanliness falls somewhere on a “clean” spectrum from every last item put away every day to rarely cleaning and never seeing the floor of the child’s room. There are many variations along this spectrum that are normal and work fine for families. Some families clean each night before bed. Some thoroughly clean bedrooms once a week. There will be times when extra cleanings are in order and times when the kids play without making too much of a mess (not many of those, though!). It doesn’t matter where you fall exactly on this spectrum as long as you have a system or routine for encouraging cleanliness. Don’t force children to clean. You won’t win. Some days your children will be cooperative, other days not so much. Encourage them to do at least something, such as pick up five toys. But if it’s not going well, it’s best to do it yourself or leave it for another time. There’s no benefit to having a battle about cleaning up. Don’t fret about your children not learning to be clean or responsible. View your children’s abilities to clean with a long-term perspective. Don’t overreact to one day’s failures. Just let it go and hope for a better day tomorrow. I know it’s hard to know what age you should start expecting responsible cleaning behavior. My main answer is, older than you think! Once your kids reach ten or twelve or sixteen you will see how little and young a five year old is. When your oldest is five you expect a lot of him and worry that he will never be responsible. But there are many, many years for him to learn this! Here are the main ingredients for clean and responsible kids: 1. Your good attitude toward and positive modeling of cleaning. 2. Your kind but firm guidance for them to clean, with increasing responsibilities as they age. I’m a pretty clean person and for me a clean house is a high priority. I still “make” my teenage daughters clean their rooms; although make is not really the right word. I encourage it often and even offer to help them. They don’t usually want my help, but they are pretty cooperative about keeping their rooms clean. I communicate my feelings to them on a regular basis, telling them why I feel it is important to keep their rooms and the house clean. Their rooms might get messier and messier for a few days or weeks, sometimes because they are extra busy. When I know we have a free weekend, I’ll instruct them to work on their rooms. I still give discrete instructions such as, “Please pick up the clothes on your floor” or, “Your garbage needs to be emptied.” I try not to bother them too often about it, and I try to be very positive about the clean portions of their rooms. If it became a real battle and rift in our relationship, I would lighten up. In summary, getting children to clean their rooms is more complicated than you would think. You have to work with them at it (literally, both of your working together), have a positive attitude about cleaning in general, try to make it fun, don’t expect too much too soon from them, and model cleanliness in your own life. 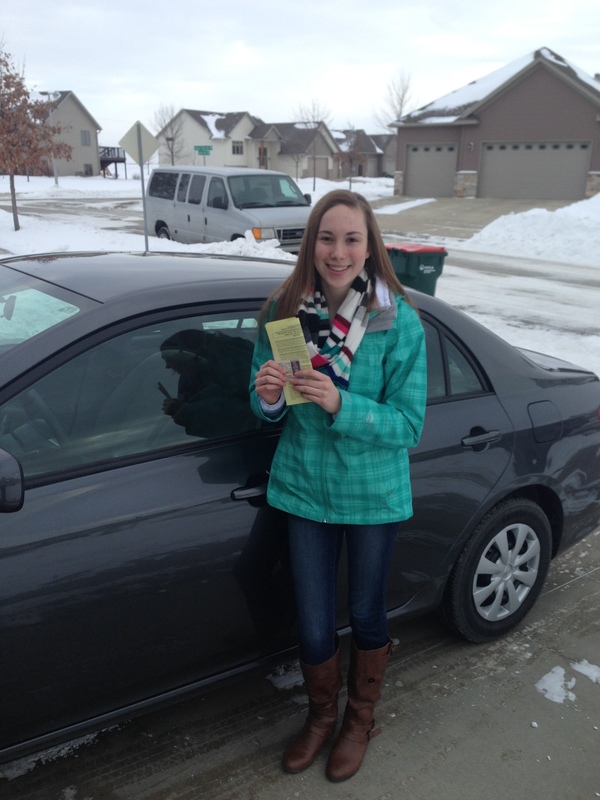 My oldest daughter just turned 16 and got her driver’s license. Many people have asked me about our rules for her driving: What time is her curfew? How far can she go? Whom can she drive? My simple answer is we focus more on our relationship than the rules. My husband majored in Family Science while doing his pre-med courses at BYU. In one of his parenting classes he learned about this concept. He learned the importance of cultivating a relationship with your teenager over enforcing a long list of rules. Many people think that when it comes to parenting teenagers you’ve got to “lay down the law” and battle them to get them to obey and behave. Parents think you’ve got to establish a lot of rules and consequences and be on the lookout for any misbehavior or rebellion. But there is a different way. If you have nurtured a good relationship with your child, you can focus more on that bond for influencing good behavior than any rules and punishments. This philosophy is based on an understanding of the developmental growth that occurs in the teenage years. Growing up includes the process of separating from parents, and by the end of adolescence that separation should be complete. Parents will and should have less and less influence. In Parenting with Love and Logic the authors describe this situation with V and an inverted V as two symbols of children’s decision making as they age. The upright V shows that when children are small (the bottom of the V), they are not making many decisions on their own. The parents control most of their lives and make most of their decisions. Parental control decreases over time as children mature. Children learn how to make more and more of their own decisions, and by the time they leave the house they are equipped with the skills to live independent lives. Some parents mistakenly subscribe to the inverted or upside down V philosophy, where young children are given many liberties and allowed to make their own decisions (many of which may be beyond their developmental level). Then as the child grows, the parents clamp down and implement more rules (presumably to keep the rebelling teen in line). This is a vicious cycle because it leads to more rebellion from the teenager, followed by even more rules from the parents. This kind of cycle can dampen the parent-child relationship. Interactions start to focus on reviewing and enforcing the rules and this leads to a more closed-off relationship. With a strong relationship already in place, parents are ready to guide their children through adolescence with less and less control over their choices. This doesn’t mean you don’t know what is going on with your child. In fact, it is the opposite. Through your relationship you know a lot about each other. Rather than reviewing rules, you are getting to know your child in a more mature way, trying to understand what the child is thinking, learning, doing, and experiencing. You have mutual respect and consideration, and you communicate about what is going on each day. You know where your child is and what they are doing, not because they have to tell you, but because it is a natural part of your relationship. In the context of a relationship, the child understands that she can’t come home whenever she wants, because her parents will be wondering where she is and would be worried about her. She wouldn’t take the car without discussing it because the parent might need it. In this system, parents expect the child to talk to them regularly, not just to inform them what she is doing, but to have an open discussion together. This might include the child recognizing that what she has planned won’t work for the family as a whole. For example, if a child says she wants to go to a friend’s house after the football game and stay out until one am, the dad might explain that the family has an activity planned early Saturday morning, and so she will need to come home earlier. Don’t get the wrong idea that keeping a healthy, strong relationship with your teen is easy! It takes work, patience, and self-control. But it is possible, and it is preferable to viewing your teen as an adversary and trying to control her behavior with rules. In the book How to Hug a Porcupine, the author goes into detail about how to create and maintain a positive relationship with your child from about age 9 on. The tween years (9-12) can be the time when children start to get “prickly,” harder to love and more distant. The author describes how to overlook the difficult but normal behaviors (similar to the difficult toddler behaviors I talked about in Why Is She Crying?!) and forge ahead with a positive attitude toward bridging the gap that your child insists on creating. If you get in the habit of these helpful tactics, you will have a good relationship in place as your child enters the teen years. Don’t expect that this will always go smoothly. There may be a time when your child forgets or doesn’t want to communicate and just stays out late without explanation. When this happens, try to keep you irritation in check and have a discussion (not a lecture or a reprimand). The discussion centers on finding out what happened and why the communication broke down. Give the child the benefit of the doubt, asking for her perspective rather than launching into a lecture about how terrible the behavior was or how it impacted you. Believe the child wants to make good decisions and keep up the relationship, and reemphasize that expectation. Assume the best of the child, and be surprised when she doesn’t behave in that way, rather than assuming the worst and trying to “catch” her in a mistake. It makes a big difference to come at the relationship from this perspective. Again, it’s not easy, but it is possible. We are fortunate to have this foundation of a good relationship with our daughter (the new 16-year-old), and therefore don’t have a lot of rules in place for her. She tells us where she’s going, whom she’ll be with, and when she’ll be back. We decide on an appropriate return time depending on the particulars of each situation – week night or weekend, what the activity is, etc. If she gets into a phase where she doesn’t want to tell us these details, where she wants to pull away emotionally and gets annoyed when we “make her” talk to us, we will remind her of this concept. We’ll tell her that we prefer to have a relationship instead of a lot of rules, but that requires consistent and respectful communication. We’ll be understanding and sympathetic, knowing this emotional separation is a normal part of growing up and not something to get annoyed about, but we’ll be firm in the fact that we need to know some of these details before she goes out. Step One: Decide what your rules are. This is really where the difficulty comes in with electronics, because we don’t have a sense of cultural or family norms. With many other situations you can look to what your parents or other parents you know or admire did, but with electronics everyone is new at it! All parents are floundering, walking around blind, bumping into (metaphorical) corners and chairs. Talking to other parents helps some, but there are so many particulars – type of electronic, age of child, personal comfort with electronics, knowledge of parental controls. It used to be you could reasonably keep electronics (computers) in the main living area, but more and more children want their own personal device. You have to decide: Are you going to have all electronics on the main level? Have them “turn them in” at a certain time at night? Turn off the wifi at a certain time? Monitor their usage through history or mobile updates? There are many options. When you are figuring out your family rules talk with your spouse first. Explore how you both feel and make a plan for what the restrictions should be. Then present the plan to the children and get their input. Involving them in the discussion (in a developmentally appropriate way) will help them be more invested in the rules. Be sure to listen respectfully to all their ideas, experiences and concerns. They may have some valid feedback to consider and you will possibly modify the rules accordingly. We sometimes present it like this, “We are worried about your electronic use (maybe elaborate on the specific worries and/or reasons these behaviors can be harmful). What ideas do you have to fix these problems?” These types of discussions can lead to some very useful information – how they feel about their own usage, what their friends’ rules are, what apps or sites they like or visit frequently. It’s a time for open discussion about issues that are important in their lives. I’ll tell you a little about our experiences and rules we’ve set. This is not meant to be a template for your situation because each family is different, but you might benefit from our example and learn some lessons sooner than we did. A few things that seem like no-brainers now took us a while to realize. Requiring the door to be open when using a device was the first of these. The oldest child complained that the younger ones were loud and annoying, so we allowed her to have her door closed. She would be holed up in her room for hours playing on her device. Once we figured that out, we changed the rule to doors must be open when using a device. After a while we changed again, and now we only allow device usage on the main level. 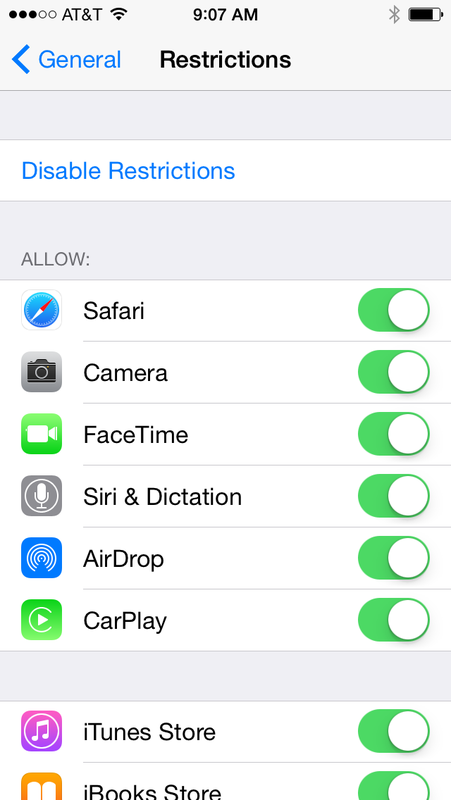 Our second discovery was Restrictions on Apple devices. If you go to “settings,” “general,” “restrictions” you are able to set up a 4 digit passcode (on EACH separate device) and then set the age appropriate levels for many different aspects: music, apps, websites, games, etc. It is the simplest, most effective way to limit what content they are consuming. I wish I’d known about it from the beginning! One friend told me that when she gave her 10-year-old an Apple device she simply took off the Safari (web-browsing) app. There are plenty of other fun ways to use the device without surfing the internet. Here is a screen shot of the Restrictions menu. It’s very simple to turn off certain applications or set maturity levels for various media. Here’s a summary of our other rules or methods of dealing with electronic usage. The wifi goes off at 10:30 pm. We literally unplug the router because I couldn’t find a system that would turn it off for certain devices at certain times. The iPhone can still be used through its data, so her data is turned off at 10:30. I set this up on AT&T’s website through our account. We created an Open DNS account. I set it up to restrict adult websites all the time, and restrict social media usage (what Open DNS calls “time wasters”) after 10:30, just in case we forgot to unplug the wifi. We don’t allow use of electronics while making or eating food. Likewise, they are not allowed to use them during family dinner or family meetings. There is a time limit for Netflix watching. We wanted to make a rule that they have to hand over the devices when we ask for them, because really they are ours. Even if they bought the device themselves, we pay for the phone service and the wifi. We got a surprising amount of resistance on this, partially because we didn’t set this up as an expectation from the beginning. They really believe the devices belong to them and that we are invading their privacy by looking at them. I can understand their position somewhat. On the one hand, we as parents need to be monitoring not only the amount of time they use devices, but also what they are doing on them and with them. However, it is also like reading their diaries in a sense, or listening in to both sides of their phone conversations. It’s a tricky balance. I decided to set one hour a week when they give their devices to us. We chose Sundays from 6:00-7:00. The regularity helps solve a few of the problems. First, it gets the girls in the habit of handing over their devices. It is a weekly reminder that the devices do not belong solely to them. Second, it gives us a weekly reminder to check on what they are doing. Without a system or routine, we tend to forget to do this regularly. We look over their usage and do a quick check (or a lengthy one, if warranted) of their texts, emails and posts. This is not a complete solution. They still can and might delete their web page history or texts. We just have to trust that we have a good enough relationship with them and have taught them correct principles well enough that they will make good decisions. We do allow exceptions to these rules, especially when the children calmly explain what they want. As I explained in the post Use Your Words, I want my children to learn that the more words you use the more likely you are to get what you want. For example, if friends are over, the internet can stay on beyond the usual time. Or, over Christmas break if they want to watch an extra show on Netflix, that’s okay. Here is a link to a blog with more tips on parental restrictions. There’s a menu at the top with options for various devices and apps. It can be complicated and time consuming, but that’s what parenting entails in the 21st century! Once you’ve decided the rules for your family, give yourself permission to change them as needed. If you try the rules out for a few weeks or months, you may find they don’t work for various reasons. It’s okay to say to your kids, “We’ve realized this isn’t working, we’ve reassessed and these are the new rules.” The rules are necessarily going to change through the years as your kids get older and the devices change. Now we come to Step Two: Calmly enforce the rules. The rules you decide on are somewhat arbitrary and may change, but once you have chosen your regulations, you can be certain you are doing the best thing for your family at this time. If you are unsure, children can sense that and will test you more. Also, being unsure makes you more frustrated and more likely to lash out at them (when it’s your uncertainty that is really causing the stress). Be secure in your rules and present them in a confident, sure manner. Also, present them in a positive manner, explaining that it’s your responsibility to keep your children safe and help them develop good habits around device usage, and that you want to encourage real things with real people as much as possible. As you explain and implement the new rules, your children may (probably will) complain and balk at first, and you may be worried that it’s going to be terrible. But, BELIEVE ME, I’ve done this many times and always found that they get used to the rules. As long as the rules are enforced in a calm, kind way, there will be no long term negative detriments to their health or well being, or your relationship with them! At first it seems dreadful, but after a while everyone gets used to it, and things go smoothly. For the first while we took away their devices for various lengths of time as the consequence of not following the rules. But this started to feel like we were trying to “catch” them breaking the rules, and I felt it wasn’t conducive to a respectful and trusting relationship. It finally dawned on me that I was not being true to the principles in this blog! I was focusing on consequences (which were really just punishments) because doing so was easier and more straight forward. We decided to change our ways and do away with any consequences, except in extreme cases. Now we use the methods outlined in this blog. In Stop and Redirect I explain how most misbehavior can be addressed with a simple reprimand and instruction. In this case I would say, “Remember not to use your phone in your room. You’re only supposed to use it on the main level.” The next important step in managing children’s behavior is Positive Reinforcement. We notice the times when they are using them on the main level and say, “Thank you for obeying the rule of being on the main level. I appreciate that!” We also make sure we Stay Close to Our Children in other ways, to maintain a positive relationship and to know what is going on in their lives. We set up and modify the rules by having discussions with our daughters, listening to their points, and responding respectfully. Through this process, they became invested in the rules and verbally agreed to follow them. After that we give them the benefit of the doubt that they want to follow the rules, they just forget sometimes. If they are repeatedly disobeying or forgetting the rules we would take the device away for a time (corresponding with the misbehavior) but that is not our first line of defense to encourage obedience. When it was our first line of defense (when we were looking for disobedience and readily handing out punishment) it set up an adversarial relationship – one based on the premise that they will misbehave and we must “catch” them at it. It just didn’t feel right to us. So, in summary, to regulate electronics you apply all the parenting principles in this blog just as you would with any parenting dilemma. You explain expectations; you phrase it in positive ways; you reinforce the good behavior; you prevent your own irritation. You address your own issues, and you practice patience. Deciding the particular rules can be difficult, but after that you just stay calm and be kind! There is another post about electronics here. Some of the content is overlapping, but it is all important! The more I learn about effective parenting (from observation and from study), the more I realize parenting without irritation is a key principle. I used to joke with my husband that this would be the title of my parenting book, were I to write one. As I have watched other moms that I admire, and as I’ve “experimented” with my own children, I’ve found that the most successful parents are the ones who enforce the rules, but don’t get irritated by the misbehavior. Let’s be honest, a lot of children’s behavior IS irritating. They whine and cry and say the same things over and over and want to do things on their own and tell you that other kids have it better. The list is endless! But you’re not going to be an effective parent if you are consistently irritated. So, take a deep breath and pretend you aren’t irritated. Learn to tune out the annoying stuff and focus on the cute and good stuff. It’s really a tricky thing, though because you can disengage and not care what they are doing and not “toe the line” or enforce your rules – then you are not irritated, but you’re also not parenting effectively. So the trick is to monitor and correct their behavior WITHOUT becoming irritated! You say what needs to be said, “You may not drink fruit punch over the carpet,” “You need to finish your chores before playing with friends,” etc., without going on and on. Here are some tips for staying patient and not getting irritated. See also Practice Patience. 1. Ignore inconsequential behavior. The majority of annoying behavior is not really “misbehavior”. It may not be your favorite behavior, but it’s not worth it to draw attention to it (and possibly reinforce it in the process). Let these behaviors serve as a reminder to give Positive Reinforcement. A classic example is nose picking. No parent wants to view this, but many have found that asking them to stop doesn’t work, or sometimes makes it worse. The best thing to do is say nothing when he is doing it; then find a time when he is not doing it and say, “Thanks for not picking your nose while we talked! Mommy likes that.” This may sound a little ridiculous, but do this a few times, without sarcasm and without making a big deal of it, and you will see the behavior change. On the other hand, if you’re asking him to stop all the time you’re not only drawing his attention to it, but yours, and then you feel irritated because “he picks his nose all day long!” Tune out the unimportant but annoying behaviors and choose to focus instead on the things the child does right. 2.Understand the child’s developmental level and have appropriate expectations. This is one of many places where my favorite phrase needs to be repeated over and over, “That’s just how kids are.” Kids take a long time to get ready for bed; they have to try to do things themselves; they have to see things or know the answer; they aren’t very patient; they hit others easily and often; they can’t stop talking. These are normal behaviors for kids, but yes, they can be irritating. But knowing that these behaviors are part of their developmental process can help. You have to take the bad with the good, and just get over it. Certain things are too much to ask of children. Be familiar with what to expect at each age and what they are capable of. If you’re feeling frustrated repeatedly with a child over a task such as not cleaning up or not eating by himself or not dressing herself, you are probably expecting too much! She may not be ready for that task, and you have to take your expectations down a notch, which can be frustrating, I know. You really think the child should be able to do this task, and you want to hold on to that and make her do it, but the end result is you’re getting frustrated over and over. So it’s better to tell yourself, “That’s just how kids are,” “It’s too much to expect.” And let it go. Sometimes the child will have performed that task last week, but that still doesn’t mean that he can necessarily do it this week. Children’s progression is not linear; it’s not a straight line up the graph, getting better and better each day at responsibilities. It’s an up and down line, which is so maddening to adults! They will be doing something for a while (making their bed, playing on their own, sharing their toys, etc.) and a few weeks or months later they’ve gone back to the old, less desirable behavior. You always have to remember that what a child can do one day or month he can’t necessarily do the next, and don’t be irritated by this fact! If he is progressing or focusing more on large motor skills (climbing, riding a bike) then his attention skills may suffer during that time, or vice versa. This is not a conscious choice for the child, it just happens. Lots of progress in speech can accompany a slide in a child’s ability to unload the dishwasher without a fuss. 4, Reframe the behavior. If you try to understand the motivation behind an annoying behavior it can become easier to take. A child who swears is trying out those words to see how it feels to say them (not that this behavior should be ignored, just dealt with in a teaching manner rather than a punishing manner). The child who insists on putting on his own shoes is trying to be independent (and we all want independent children eventually!). You can also reframe to “Looks like I haven’t taught him the correct behavior yet.” Then you’re not annoyed by the misbehavior but reminded to teach him the right way to act. A stubborn child who must get her own way is going to be a very successful adult (studies have shown!). Looking at the situation in a different, more positive light can help reduce the irritation. In between writing and publishing this post I was able to apply this principle. I’d purchased an online winter driver course for my almost-16-year-old daughter and wanted her to watch it. She had expressed interest in it before I bought it, and it would expire in two weeks, but now she was being negative about it and putting it off. I was getting irritated and starting to nag, when I realized that she’s nervous about driving in the winter, and that anxiety was behind the dawdling behavior. Realizing this didn’t change the fact that she needed to watch it, but it greatly reduced my irritation and helped me empathize with her and help motivate her in a loving way. 5. Don’t give unrealistic consequences. If you give excessively long or unrelated consequences the child is not going to learn from them and chances are you will not follow through. Then you become irritated because she doesn’t listen to you, she doesn’t obey what you say, she’s not made to obey by the threat of consequences. You feel ineffective and like you have no tools to draw on. All that can make you very irritated! You have to remember to say few words, focus on the good, give consequences sparingly and that are close in time and related to the misbehavior and follow through on them. See Stop and Redirect. 6. Create positive interactions with your child. When your child is having a particularly hard time obeying (a phase over a few days or weeks) this is the time to spend a little extra time with him. Give him your love and attention and he will feel comforted, but you will feel more positive about him also! Many days all we do is critique – point out the negative behaviors. That does not build positive relationships. That can become a relationship that the child wants to get away from when he can (in adolescence). You have to point out the good and take extra time to create positive interactions. Do something that both of you enjoy. Then you will see and feel the good in your child and not be as annoyed in the hard times. See Stay Close to Your Child. 7. Identify what is behind or causing your irritation. Sometimes your own issues get in the way of enjoying your children and disciplining/teaching them appropriately. It takes some insight to realize this, but when I examined my feelings I often found the following factors were at the heart of my irritation. My pride. I am extra irritated when my pride is on the line. If we are at a public event where specific behaviors are expected, I am extra irritated with misbehavior. When my parents are around and “observing” my parenting, I am extra irritable. These are different moments for each individual person, depending on what matters to you. But when your pride is on the line you have to stop and realize that. Have some insight into the fact that this is YOUR issue, not the kids’. The kids are being the same as they always are! They’re just kids, sometimes behaving, sometimes not. But if I have extra hyped up expectations of them, I’m likely to be extra irritated. My indecision. There are many times when I’m not sure what the right answer is. Should I let her quit piano? Should I make her sit right by me at the function or let her run around? Should I let her spend all her allowance on silly trinkets? These are tough parenting decisions, and I feel like I get more irritated with my children when I don’t know what my right answer is. They keep asking and I can’t decide, or I decide one thing and then question it. Again, it’s okay to struggle through these times, but I just have to remember the reason my irritation is heightened. The child’s behavior hasn’t changed. They are always going to beg for what they want and ask for things that probably are not in their best interest. I’ve found that I’m less irritated if I just make a decision and stick with it. Many of these decisions are arbitrary anyway! Just decide and follow through, and that reduces irritation. My lack of follow through. When I say, “It’s time to go,” and then talk and talk, I can not be irritated that they are not waiting at my heels, coats and shoes on. Of course they are off playing! They know that “It’s time to go” means “You can play for 5-10 minutes while I talk”! The more I say things I don’t really mean (I’m going to take that away, it’s time for bed, etc.) the less the children will behave. And that causes me to be irritated: “Why don’t they listen to me? !” I must remember to only say what I mean and follow through with what I say. Parenting books. Parenting books cause me frustration. They say, “If child is doing X, you should do Y,” and infer that doing Y will make the behavior will go away. They set you up for disappointment! I’m not saying don’t read them (I am addicted to reading them!) but I just have to keep in mind that any change takes time. There is no magic cure. And kids are going to be irritating and misbehave no matter what you do. I want to reiterate that the best thing I did as a parent was identify an overall philosophy (which is what this blog is trying to give you) and not get caught up in the small, frustrating interactions. When I had a clear vision of parenting principles and things I was trying to accomplish (stay close to your child, have positive interactions, stay calm, etc.) then I could get through the tough times without overanalyzing or getting caught up in the emotions. Before I had my core parenting principles I felt like each day I was judging myself and my child based on current, minute-to-minute actions. It was maddening to have to worry so much about what the right choice was. Once I developed my core principles I could relax a little and avoid getting overly irritated. Patience is a commonly sought-after virtue among parents. Children are exasperating and can quickly extinguish any intentions you had of being patient that day. Some people may think patience is not part of their personality, but it is in fact a skill, something that can be practiced and improved. It takes a long time, and the progress is slow and steady, but don’t give up on yourself or get discouraged. Just know that the more you work at it the easier it will get. Do the hard work in the beginning, and it will pay off in the long run. If you’re having a rough day just think you’re laying the ground work for a better future. Here are some ideas and suggestions to help you keep your cool. *Count how long it takes. This is a technique I developed around the time my toddler wanted to put on her own shoes (“I do it myself!”). It seemed to take forever, and it’s SO boring just standing there waiting for them to do something that I could do in a jiffy. And actually it’s the standing there part that takes the most patience. Even if I completed the task in the same amount of time, it would feel better because at least I was doing something. So, I decided to start counting to see how long it actually takes her to put on her shoes, or complete whatever task she insisted on doing herself. If nothing else, it gives you something to do while you stand there waiting! Guess how long . . . about 30 seconds! I rarely got to 30 before she was done. I decided I can wait 30 seconds for her to have her way, learn independence, and have my approval for a task completed. It’s important for children to do things on their own, of course, and this technique helped me get through those tiresome moments. *Take it down a notch. When I was in training as a social worker I learned about de-escalating tense situations. When people are angry or in an argument tensions can get high, and if one person starts yelling or getting physical, the others will follow or even go one step more. One of the techniques to de-escalation is speaking calmly and slowly. Others will be influenced by your speech volume and pattern, and everything will start to calm down. This is an excellent way to stay patient with frustrating children. When you feel yourself getting worked up, think “take it down a notch.” Visualize a peg being taken out of a high hole and moved down to a lower one. Slow down your actions, lower your voice. Pretend you’ve been given a sedative, and everything is slowing down. This gives you time to think before you speak and will help you avoid doing anything you will regret. Sometimes you have to “act” like you don’t care as much as you do (about the dirt tracked on the carpet, or the hit to the sister, or the tantrum occurring before you) because caring will just make you mad, and there’s no benefit to that. What would someone who didn’t care look like and act like? Think about that and be like that, just for the time being. You can decide how you’re going to deal with the problem behavior later, when you are calmer. When you’re getting angry and upset all your blood rushes to your heart and limbs (fight or flight mode) so it’s not the time to problem solve or react with a punishment. Just take it down a notch. *Visualize your body melting. This is related to the above technique, but a different visualization. For a few seconds try to relax your muscles – starting with your head and face, down through your shoulders and arms, down your legs, finally to your feet. Feel yourself getting calmer. Try to let go of the anxiety that is building in your core. It’s not helping anything! It’s not productive. Take a deep breath, maybe close your eyes if that helps, and picture your body melting. Again, realize that you’ve just got to get through this situation without doing or saying anything you regret, and then you can deal with the problem behavior when you are calmer. You will deal with the behavior by reviewing the other principles in this blog: assess the situation to see if you are expecting too much, if the environment is setting him up for success, if you are complimenting the desired behavior, if you’re spending enough quality time with him, and make a plan for what behavior is expected and what you’re going to do if that doesn’t happen. When you have a plan in place (and a general parenting philosophy) there is less reason to get upset. Yes, it’s frustrating that he is misbehaving (AGAIN!) but you know what to do about it. *It’s better to forget and smile than remember and hurt. I kind of hate this saying, because it’s so true. I want to remember; I want to tell everyone how bad my child is and how she makes me suffer! I want my husband to know how hard staying home is, so I’m going to hold on to the anger and the hurt until he gets home! But who is that helping? No one. It’s only hurting myself. I’m the one who carries around that dark baggage all day (or week or year!). For the little things, it’s better to get over them quickly. I had this saying taped up on my wall for over a year. It’s a hard habit to break, but just let the happiness in! Move on! Now we’re in the next moment, and there’s a chance the child will behave, and you’ll have a great interaction. Forgive her and smile! *“That’s just how kids are.” Another phrase to repeat or hang on your wall! I have to tell myself this one all the time. Sometimes children are SO exasperating, SO frustrating that you are sure this can’t be normal! I used to always think to myself, “Either there is something wrong with her or there is something wrong with me!” I actually made an appointment with the pediatrician when my oldest was about 6. I had had it. I just felt like nothing I was doing was working, and I was getting so angry and frustrated. I started to wonder if there was in fact something wrong. He was so kind and patient with me. He started out by going through a long checklist of behavior problems, and to almost all of them I said no, she doesn’t have or do that. It was a real eye-opener to me. There are a lot worse problems out there than what I was dealing with! In the end, he said, “I feel like I could be talking to my wife – she has the same worries and concerns – but your child is absolutely normal.” As you can imagine, I was about in tears! It was so relieving, but also a little scary. You mean, that’s just how kids are?! Who came up with this idea?! Who ever thought that we, weak, flawed parents could deal with this?! Sometimes I turn comedian and say to myself, “Have you heard what they say about parenting? It’s hard – yeah, that’s what people say, so I guess I must be parenting!” Everyone knows parenting is hard, but it’s so very, very hard when you are the one doing it! But you can take comfort in the fact that everyone is in the same boat. That’s just how kids are – pestering, inquisitive, non-stop talkative, stubborn, resistant to sleep, picky eaters, bad friends, at times violent, impatient, and without manners! But, knowing this truth can help us be more patient. Understanding what is reasonable to expect and what isn’t can help us set up the situation for success – for both us and our children! *Now is not forever. This follows nicely after “that’s just how kids are” because here’s another truth about children: They will change! They will grow! They will learn (eventually)! The saying ‘now is not forever’ is true in many parts of our lives; our problems, feelings, relationships, even health issues ebb and flow. But it’s especially true with parenting because our children are getting older every day. They are maturing and developing greater capacities to modulate their emotions and use their words. They are becoming more independent and reliable (don’t expect too much too fast though!). Just repeat this mantra over and over, and imagine the day when you will miss the messes and the noise. *Don’t lose your cool. I know this is obvious, and you are thinking – if I could do this I would be a patient person! But I want to say this to remind you that it’s not worth it. It feels good for a moment to yell and get really angry and maybe even spank, but it does not have any positive benefits. It’s easy to give in to speaking harshly and to negativity. I’m sure you’re like me and have thought of saying some terrible things (and some hilarious, sarcastic remarks, too!) but you must control your words and not speak them. To say mean and harsh things to children is to show that you have as little control over your actions as they do. It does not show the example you want to be of controlling words and actions, even in times of strong emotion. Isn’t that what we ask of them all the time?! When you lose it with a child, her behavior will worsen, not improve. She will use those same words and tones with her siblings. It’s just a negative cycle. It is so, so, so hard to control your tongue in these super angry situations, but you must keep trying. If you fail, forgive yourself quickly and move on! You can apologize to your child, if appropriate. You could say, “Mommy felt very angry and said some unkind things. We are supposed to use our calm words, even when we’re angry, and mommy is going to try to do better in the future.” It’s not going to be the end of the world, just review the principles in this post and start again tomorrow!